Atty Merritt with client L’Daijohnique Lee whose beating by an armed White man was captured on cell phone video. 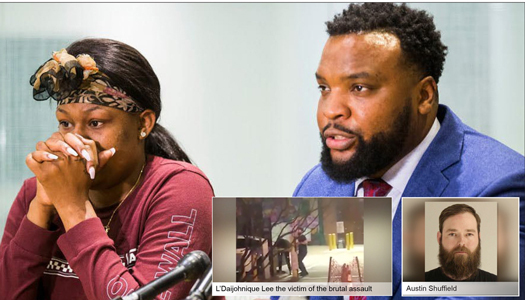 DALLAS—In the early hours of a Thursday morning, L’Daijohnique Lee, a Black woman, found herself in fear for her life as she suffered an assault from a gun wielding White male in the Deep Ellum section of the city. Cell phone video, which has gone viral, allegedly shows Austin Shuffield knocking Ms. Lee’s phone out of her hand as she attempts to call the police. The man in the video brandishes a weapon, pummels her and unleashes racial slurs in what was apparently rage over a parking space. Ms. Lee was brutally beaten. At a hospital, she was diagnosed with cranial swelling and post-concussion syndrome. Mr. Shuffield was initially arrested and faced misdemeanor charges in the March 21 attack, including assault causing bodily injury, intoxication, and interfering with an emergency call. He was released from jail on a $1,500 bond. A week later, felony charges were filed against Mr. Shuffield for his alleged attack on Ms. Lee. “We are pleased to learn about the additional felony charges against Austin Shuffield referred to the Dallas County District Attorney’s office by the Dallas Police Department detectives,” said Attorney Lee Merritt, who is representing the victim. Blacks in Dallas had expressed outrage the White male was not initially charged with felony crimes given the firearm and what they called hate speech. This was one of several incidents in recent months captured on cell phone video showing Black women being punched, kicked, slapped and no one coming to help. People stood by and filmed the incidents. In New York, a 36-year-old Black man has been arrested on suspicion of carrying out a vicious attack on a homeless Black woman that was caught on video. Marc Gomez faces charges of assault and harassment. Police say the 78-yearold woman was riding a train in the Bronx around 3 a.m. March 10 when he kicked and punched her repeatedly in the face and body. Before Mr. Gomez left the train though, he let everyone know he was fully aware that he was being recorded by saying “Worldstar that my ni**a,” referring to the popular website WorldStarHipHop.com, which is known for its shock content and fight videos. Video screenshots of 78-year-old woman attacked on subway. Officials said the 78-year-old woman rode the train to one more northbound stop and was met with first responders as soon as she stepped off the train. She was taken to the hospital and treated for her injuries. She reportedly suffered bleeding and swelling with cuts to the face. A lawyer for Mr. Gomez said the woman threatened the man and his family and he thought she had a weapon. 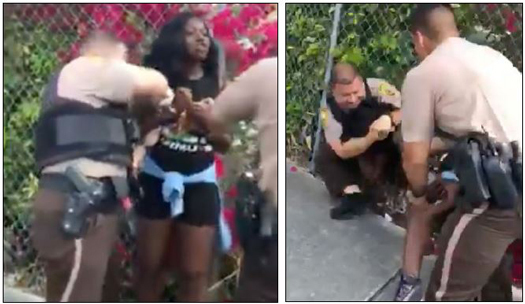 In Miami, video captured 26-year-old Dyma Loving thrown to the ground by police officers and handcuffed. She and a friend were threatened by a shotgun-wielding White male and called police. Somehow the incident escalated and the young mother found herself manhandled by cops. The March 6 video went viral. She is pushed against a fence, placed in a headlock, face pressed on the sidewalk and her wig comes off. “The video shows Officer Alejandro Giraldo telling Loving to calm down before abruptly becoming physical with her. She was taken to the police station and left in the squad car for four hours while waiting to be booked, she said. Finally, she was charged with two misdemeanor counts of disorderly conduct and resisting arrest without violence and held for 17 hours at Turner Guilford Knight Correctional Center before she was able to post bail for $1,500,” reported the Daily Beast. Nine days later, the White man was charged with two counts of aggravated assault with a deadly weapon and charges dropped against Ms. Loving. Off. Giraldo was relieved of duty with pay and was placed on an administrative assignment, The Daily Beast reported. Video sequence of Four Miami police officers throwing Dyma Loving on the ground. Miami-Dade Police Department Director Juan Perez called the encounter “video deeply troubling and in no way reflective of our core values of integrity, respect, service, and fairness” in a tweet. An investigation is underway, he added. According to The Daily Beast, Ms. Loving and her attorney plan to file a civil rights lawsuit against Officer Giraldo and other officers could be charged. Four cops were involved in the incident. On social media and in the Black Community, many are questioning why Black men are standing by while Black women get thrashed? Rapper TI, who is based in Atlanta, called out rappers in Dallas who talk tough for doing nothing after the incident. Some Black men, like Dominique Alexander, have been active throughout Dallas coming to the aid of Ms. Lee. He is one of the leaders of protests and community activism. “Austin Shuffield was a known Neo-Nazi. There is a root to Austin Shuffield, he felt like he was going to get away with it. He felt like he had the authority to beat that Black woman down,” said Mr. Alexander during a protest at Dallas City Hall. The city of Dallas makes people think when these videos go viral they are isolated incidents, but they are not, he charged. Mr. Alexander said his organization has become a hotline of sorts, getting a barrage of calls about racist attacks, but city officials seem unconcerned. “This city is made of companies worth over trillion dollars, and the city can’t seem to address simple humanity,” he added. Blacks should be able to walk down the street like Whites and until that happens, protests will continue until Black women feel safe in the Deep Ellum district, a popular destination for social activity, vowed Mr. Alexander. Black men must be retrained, commented Dennis Muhammad, who leads a group called Peace Keepers and has served as longtime captain of the Fruit of Islam in the Nation of Islam. The Dallas assault, the brutal attack of the elderly Black woman on the subway, and the attack on a Black female McDonald’s worker by a White male customer, are troubling, he said. “For the last maybe six months we have watched an increase on the attack of women, particularly Black women. We are seeing, in my opinion, not that you can just punch, kick and assault a Black woman, but you can be assured a Black man ain’t doing a damn thing about it,” he said. Men cringe and say that would not have happened, if I was there, said Mr. Muhammad. But, he continued, too often Black men are standing by as Black women get brutally attacked. The current climate bears witness to why Min. Louis Farrakhan of the Nation of Islam called for 10,000 Fearless to lessen tension and bring peace to Black neighborhoods almost four years ago, Mr. Muhammad said. “We have not heeded his call, so now we are suffering. Now we see that if we would have organized 10,000 Fearless in every city almost four years ago, then we could have been a great deterrent to some of these assaults on Black women,” he added. Davonte Peters, a hip-hop activist and candidate for Dallas City Council District 3, has been on the frontline of the protests and rallies for justice for Ms. Lee. “We are in the process of getting our mind right from institutional racism as men, but we must and are standing by our sisters in making sure they are safe. We are helping to assist them in becoming armed if Black men are not present so they can defend themselves,” said Mr. Peters. “It is a lack of respect and unity. Willie Lynch, people debate if he existed or not, that Lynch Syndrome is effecting us, where are divided and conquered and disrespectful of our women ourselves,” he added. Mr. Peters complained his generation has very little respect for women. Work has to be done to change that so Black men will act on behalf of their women, he said. Black women have been under terror since they were brought to America, said Dr. Brenda Wall, a clinical psychologist. For almost 40 years, she has studied the Black plight in America and how Blacks deal with racism. “Black women have been under attack since we got here, it is an American culture. I think it is becoming more prevalent with others seeing how we treat our women and girls,” said Dr. Wall. Black men have not stepped up to do what should be done to be in unity with Black women because the effects of slavery are alive and well for Black men and women, she argued. “It started over 400 years ago with their evil and inhumane treatment of us and we certainly see the residual impact on our families and community today,” said Dr. Wall. The horrors of the Black experience in America will immobilize and restrict one from acting even when they know they should, she said. Dennis Muhammad sees the media and viral videos playing a hand in the spread of violence. “Worldstar has made acts of violence entertainment. Our young people see that the more you videotape these things, the more popular you get. We need to shut Worldstar down and any other platform that allows this. We need to push a law that says if you record acts of violence without simultaneously calling 911 you will be charged with aiding and abetting a criminal,” he argued. WorldStarHipHop.com has become infamous for fight videos and viral violence. While it is painful, these attacks present a great opportunity to organize and mobilize Black men, Mr. Muhammad observed. He along with the Peace Keepers, who work as volunteers to promote peace across the country, will be in New York working to make neighborhoods safer for upcoming months. More Charges, Changes in Dallas? On the legal front, Atty. Merritt said Ms. Lee will fully cooperate with District Attorney John Creuzot, who has indicated he would like to interview her directly to ensure a thorough grand jury presentation. Atty. Merritt also believes hate crime charges could be added after the district attorney interviews Ms. Lee. And that’s not all: The attorney and his client were recently captured on video at a gun range. “#DaiLove and I earned our License To Carry today. Neither of us particularly care for guns but after her ordeal we decided to take additional steps to ensure her security. Sitting through the four hour course we learned of at least three additional crimes committed by her assailant, #AustinShuffield, who was not licensed to carry a firearm. If you are going to carry a gun do so legally and safely. Our community will not continue to be targets,” the attorney said in a Facebook post. Jihad H. Muhammad is a contributing editor for Texas Metro News, The Garland Journal, and the women’s internet magazine I Messenger. Final Call staff and the Associated Press contributed to this report.